Then you will find kate.exe in kde/bin/. Who do you target at? There is a whole lot of editors for windows, why would a not-kde-user want to use kate? That is true. But all editors come with their strengths and weaknesses. Kate has lots of good features that other editors do not have. For instance, currently I have to use Notepad++ on Windows, and as someone who uses text editor and navigation features a lot I have to say Notepad++ lacks behind a lot. But this is not about Notepad++ nor any other editor out there. Don’t forget about KDE users who have to use Windows sometimes. Like myself. Even if no-one by me uses it, it’s already worth it. Since Kate hast so nice features (e.g. the Projects plugin and its capabilities), that even only this worth the effort. I’m in this situation right now and I’m very grateful that I can use Kate on Windows. It is my saving grace and a huge boost to productivity to be able to use Kate at work. 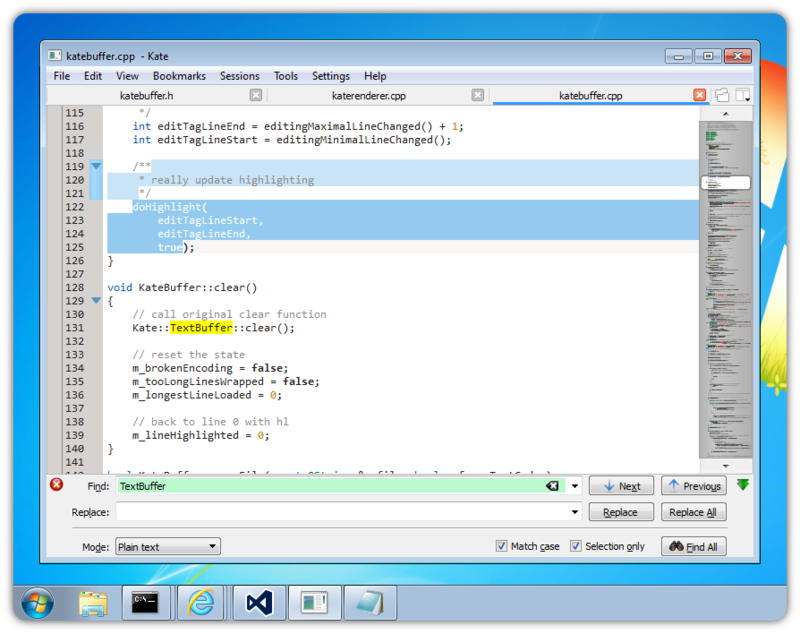 Well we have SynWrite on Windows so it’s all that needed, it has LOT more features, m-carets etc… You guys want to earn money, and want LESS work because progress on Kate is little on last time.. You made some work to Projects plugin, session plugin, but it’s little, Kate work is very slow.. Au contraire! Kate is in great shape and gains great features in every version. I don’t know what you mean. Maybe Kile could speed up, but Kate is fine. Thanks to Dominik et al.! None of the Kate developers earned a single penny in the entire 13 years of Kate development. So this is certainly not at all about money. And with respect to features. To be honest, this is not about being better than other text editors. Our goal is simply to make Kate easily available on Windows, too. Those who like Kate can use it. Those who don’t can use some other text editor or IDE. This is perfectly fine, and a valid approach. Since I spend most of my free time contributing code to Notepad++, I’d love to see a quick summary of what you think are week sides of Notepad++. Maybe a commenting system is not the best place to ask such a question, but I was intrigued by you comment and I’d love to see your thoughts on this. I don’t know much about features of Kate 5, but unless it has code folding options back to its old state (i.e. offers ability to fold/unfold all level x nodes), you guys are just wasting time and effort. At current state (which for me is what Kubuntu 14.10 with old Plasma have to offer), porting Notepad++ to KDE would be more useful, as Wine sometimes just freezes it. Funny thing is that my first contact with Kate was via some kind of cygwined KDE suite running on Windows. I liked the editor so much, that for most of my work related stuff I started to using Kubuntu and Kate. That was the case until you ‘fixed’ code folding. Now its Kubuntu and NP++ and I’m slowly switching back to Windows. i believe that kde applications, when being ported to osx or windows should take as less linux-specific dependencies with them as possible, for example dbus should be left on linux/bsd only. this is what I’m doing for Lokalize right now. After flirting with Linux Mint for less than a week (my first Linux experience), I’m about to abandon Linux and return to Windoze (which I’ve used for 28 years). But in my 5 days of (unsuccessfully) trying to get Mint to work well, I came to like Kate, the best of the ‘simple’ text editors I could find. So I would certainly be a Windows user of Kate, provided it’s not too buggy. I also use Notepad++, but that’s overkill for simple .txt file viewing and/or editing. One of the advantages of Kate over Windows WordPad (my default .txt editor) is it case-changing tool. But I always prefer hot-keys to the (slow) mouse, and your ‘case’ hot-keys are not quite logical (logical key combinations always makes them easier to remember than illogical ones!). In normal keyboard use, makes typed letters uppercase. So the logical hot-keys would be Ctrl-U = lower case (since a plain types in lowercase), and Ctrl-Shift-U for uppercase (since -U types uppercase). For consistency, you should change the KDE version to be the same, which would initially confuse long-time users. But when you publicised the change with the logic, they would quickly pick up the new usage, since it’s more logical. In normal keyboard use, [Shift] makes typed letters uppercase. So the logical hot-keys would be Ctrl-U = lowercase (since a plain [u] types in lowercase), and Ctrl-Shift-U for uppercase (since [Shift]-U types uppercase). Is it possible for you to post windows binary? If you need code folding with ability of collapsing level 2, 3, … nodes (like all functions in a PHP class), don’t even bother with Kate (there are plenty editors that can do that). For some unknown reason developers removed this feature a long time ago, and seemingly it is not coming back. I’m new in Kate, so sorry if it is not good place for my question. Can Kate predictive parameters of the build-in PHP functions? 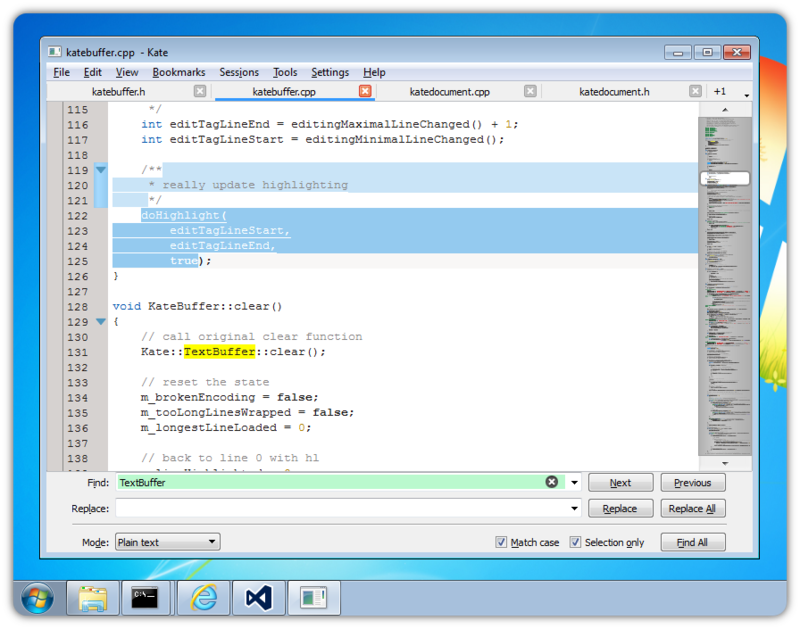 I use Kate in Windows by KDE Installer.